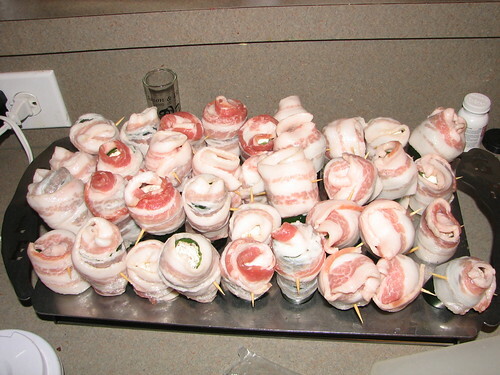 Cooking for the Office T-Giving Party has begun | Smoking Meat Forums - The Best Barbecue Discussion Forum On Earth! Discussion in 'Pork' started by jabo, Nov 18, 2006. I am cooking for my office Thanksgiving meal and thought I would post a pictorial play by play as I go. 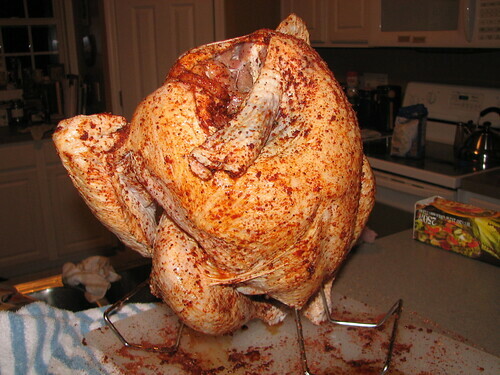 I am doing a beer can Turkey that I will be brining tomorrow. 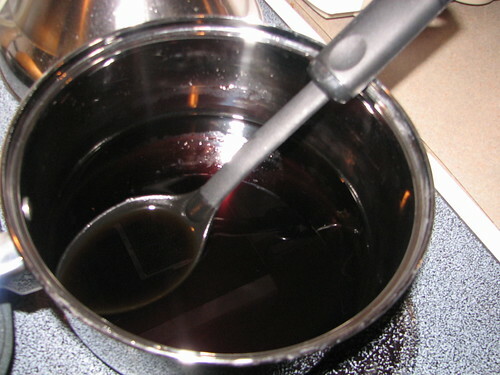 I am doing a double smoked ham using the Sweet Kiss Injection. I will also being doing ABT's 4 different ways as well as some of Dutch's Wicked baked beans. OK, the injecting is done. Wow, was that messy. I sure am glad I took it outside. 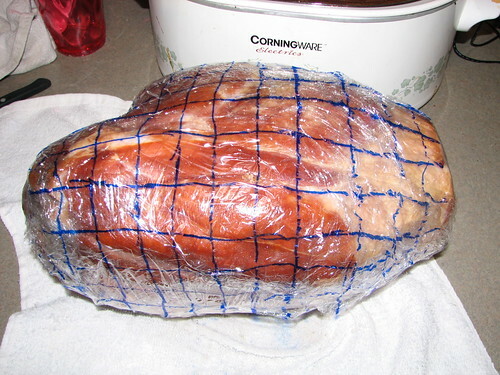 Now the ham gets a rest for about 30 hours. 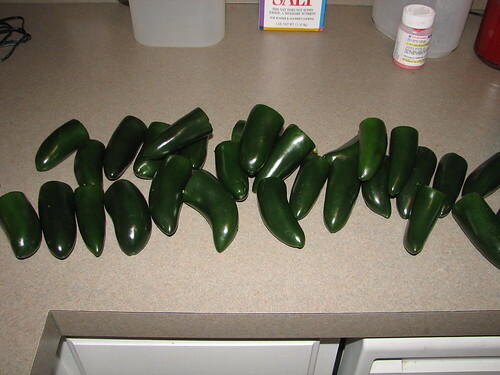 I will attach the recipe that I am using. Time for more pics. I hope I am not boring everyone with all the pics. 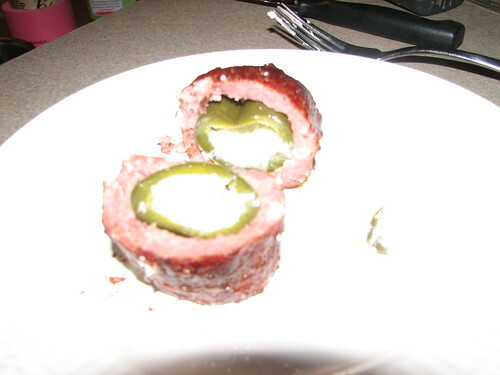 I made a couple of what I call armadillo eggs, japs stuffed with creme cheese wrapped in a thin layer of sausage. I only made two of these this time, I will make more in the future. They are good. 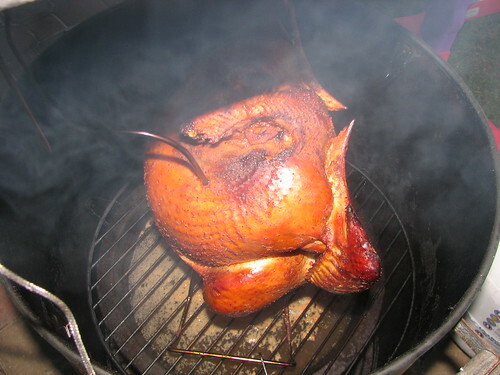 Here is a pic of the beer can turkey that I am making. 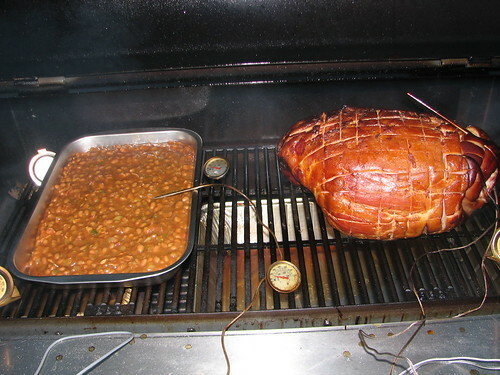 A pic of the ham going on the smoker followed by a pic of the ham when I put some of Dutch's awesome baked beans on. Anyone care to see how it turned out? Prefer to taste how it turned out! 1 slice of center cut ham and a dip of those beans please. Got my own beer thankyou. Overnight FED-EX will work for me! Edit: If there is room in the box a piece of Armadillo Egg too! Surprise me! An assortment would be nice, Iâ€™ve got buns! 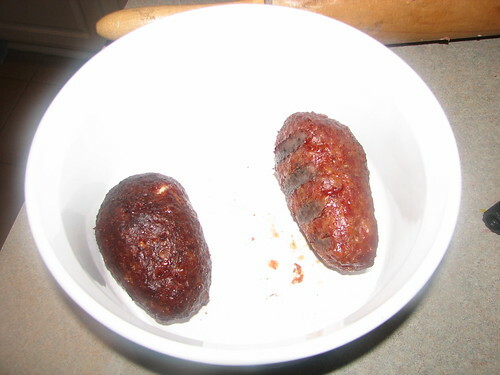 Wow everything is looking great :shock: I would defentatly like to try out those armadillo eggs yummy. Jabo- I think that you need like 5 more thermometers in your smoker. :lol: As you know I have the bbchef also. Do you really see that much variance in our rig. I am all about the science behind smoking. I also am aware of how much effort and cash goes into a good smoke. Let me know what your reading on all of thoes therms. Well of course! That's one heck of a concoction for the ham injection. What did you think of it? OK, I got to worked and was mobbed by co-workers so after pics are non-existant, but I took enough along the way to give everyone a good idea of how things were coming along. 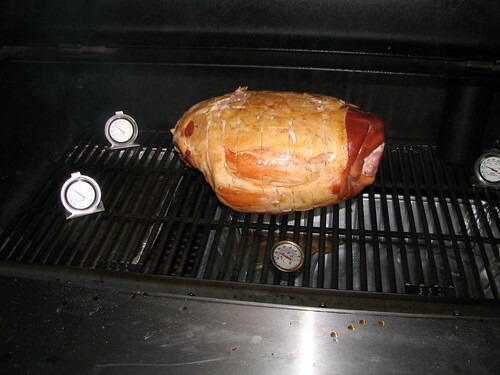 The ham was OK, a little much for me but it went over pretty well at work. The turkey was great and a huge hit. The baked beans stayed in the smoker for a long time and they were incredible. The ABTs were a huge hit. I get to do it all again tonight for tomorrow. Another turkey and another ham. Jamie, Thanks for showing this ol' dawg a new tip. Your armidillo egg idea is something that's going on my "Gotta Do!!" list. As for that "Sweet Kiss of Death" recipe, remember that you can always tweek it to make it more to your liking. Just because thats the way it's written doesn't mean you can't play with it some. Great job and great pics.